At the instigation of Cardinal Józef Glemp the Polish parliament voted overwhelmingly in 1998 to construct a huge new cathedral in Warsaw, the National Temple of Divine Providence. According to the resolution, a “yes” vote was a vote “for the Constitution of May 3 , for the freedom [from Communism] regained in 1989, for 20 years of the pontificate of [Poland’s] John Paul II and for 2000 years of Christianity”. It was hard for a patriotic Pole to vote against all of that — in American terms it would be like voting against the Constitution, motherhood and apple pie — and, indeed, 234 deputies voted in favour, with only 20 against and 72 abstentions. When finished it will have a large green dome dwarfed by a still larger Stalinist facade, a far cry from the restrained architecture of the Polish Enlightenment when the project was first proposed. The Pope was to lay the cornerstone in the Jubilee year of 2000 and it was to be completed by the end of the following year. 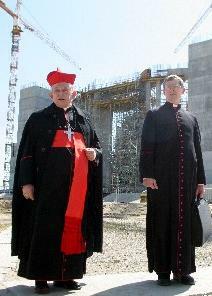 However, this photo shows Cardinal Glemp inspecting the construction site in 2007, with the building still “requiring” state funding of 40 million zlotys (17 million USD or almost 10 million GBP) for that year alone. How did the Catholic Church manage to commit the state to this? Not only by the patriotic phrasing of the initial resolution, but by widening the project in 2007. 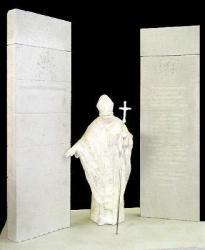 It was announced then that the cathedral would include, among others, a museum about Pope John Paul II. Museums, of course, are “culture” and that obliges the Polish taxpayer to foot the bill. The Complaint below details this and other fiscal privileges for the Catholic Church. Many are based on the Rakowski Act (mentioned below), regulating church-state relations, which was passed in the final days of the Communist regime (17 May 1989) when the Central Committee was hoping for Church support before the first partially free elections. This law bestowed a number of classic concordat privileges without the need for democratic consent. A few months later Communism was swept away, yet the Church privileges first granted by the Central Committee and the law that anchors them have remained unchallenged. Timing is everything. applying preferential non-tariff and extra-contractual price reductions for the provision of electric energy and heat by state-controlled companies (whose sole shareholder is the State Treasury), operating in the electric energy sector, in relation to Polish ecclesiastical legal persons [...]. practice involving the application of preferential non-tariff and extra-contractual price reductions for the provision of electric energy and heat by state-controlled companies (whose sole shareholder is the State Treasury), operating in the electric energy sector, in relation to Polish ecclesiastical legal persons (referred to in Articles 7, 8 and 9.1.7 of the Law) — the issue: conformity with Articles 2 and 3 of the Council Regulation 659/1999 establishing specific rules of application of Article 93 EC Treaty (O.J. EU 1999, L 83, p. 1 as subsequently amended) and Article 43 EC Treaty. The Roman Catholic Church in Poland has been granted numerous privileges. Although regulating relations between the Member States and churches and other religious communities in these states is not subject to the Community’s competence (in accordance with Article 6.3 of EU Treaty and Declaration No 11 annexed to the Amsterdam Treaty), and thus constitutes a field of exclusive competence of the Member States, there is no doubt that certain aspects of such regulations are not irrelevant from the EC law perspective (see, to that effect, case 196/87 Steymann, ECR 1988, p. 6159). It ought to be emphasised that the day-to-day practice of public authorities in Poland, strongly influenced informally by the Roman Catholic Church, leads to abusing the already far-reaching privileges granted to that religious community. This situation usually results in fraudulent preference for the Polish Roman Catholic Church (more precisely: for its institutions) not only vis-à-vis other Polish individuals, but also vis-à-vis individuals from other EU Member States. The latter means that EC law is infringed (see case C-274/96 Bickel and Franz, ECR 1998, p. I-7637). In the State Budget Act for 2007 the legislator once again provided a subsidy of 40,000,000 PLN to support the erection of the Church Divine Providence in Warsaw (the same situation appeared in 2006). Officially the subsidy is not granted to aid the erection of the church itself (as this is forbidden by the Polish Constitution of 1997), but to bankroll the erection of a museum devoted to the former Catholic pope (the museum is to constitute part of the church). We demand that the EC undertakes immediate action to make the Republic of Poland desist from subsidising this investment and to cause the repayment of the sums already paid. This subsidisation is incompatible with Community law. As for the second and the third pleas, the complainants are aware of instances in which buildings, officially destined for residential purposes of clerics and members of orders, are actually used for purely commercial ends. According to Articles 55.4 and 55.5 of the Law, real estates belonging to Polish ecclesiastical legal persons are exempted from the real property tax, however this applies exclusively to situations in which such real estates or their parts are used for residential purposes of clerics and members of orders. The Polish public authorities (the Inland Revenue) do not react when the said exemption is abused. We are of the opinion that such a situation creates a privileged position for the Polish ecclesiastical legal persons vis-à-vis individuals from other EU Member States that pursue business activities involving the use of real estate. For this reason we raise objections to the practice of the application of the provisions referred to above and we question their conformity with EC law (Article 90 EC Treaty). Analogous argumentation can be invoked as regards the third charge put forward in the petitum. The fourth plea concerns the payment of clerics’ social insurance premiums by means of funds from the State budget (the so-called Church Fund) and the covering, from the said resources, of the costs of conservation and renovation of Polish Roman Catholic Church buildings of historic value. It ought to be noted that no other individual or institution in Poland, including — in particular — individuals from other EU Member States, is equally privileged. We would like to point out that this preference gives the Polish ecclesiastical legal persons a competitive advantage in comparison to individuals from other EU Member States. Therefore, in our opinion, the fourth plea is sufficiently substantiated. The fifth plea concerns the provision of the Law pursuant to which decision making organs of units of local self-government are legally obligated to sell or establish eternal usufruct for real estates destined for religious or worship purposes in local plans of spatial management (plan zagospodarowania przestrzennego) when so requested by a Polish ecclesiastical legal person. It should be observed that in other circumstances, including those in which a request is made by an individual from another EU Member State, the request does not imply any obligation on the part of a unit of local self-government. Moreover, the challenged provision introduces an exception to the principle of freedom of contracting, according to which sale prices are subject to unrestricted negotiations between the parties. Usually, when a Polish ecclesiastical legal person applies for the purchase of real property, the transaction is effectuated at a price determined by a decision making body of a unit of local self-government, normally constituting a small fraction of the market price (e.g. 1% of the market value). We are of the opinion that the challenged provision puts individuals from other EU Member States (EU citizens and companies) in an underprivileged competitive position regarding the possibility of purchasing real property in comparison with the position occupied by Polish ecclesiastical legal persons. Polish ecclesiastical legal persons are not burdened with the consequences of the pre-emptive right of purchase stemming from Article 109 of the Law of 21 August 1997 on real property management (Ustawa o gospodarce nieruchomościami), whereas these consequences do concern individuals from other EU Member States being in an analogous situation. We believe that this situation constitutes a breach of the principle of free movement of capital, since free movement (real property investments in Poland) can only take place under conditions less favourable than those in which investments are made by Polish ecclesiastical legal persons. The exemption of Polish ecclesiastical legal persons, competing on the market of press, journal and book publishing with individuals from other EU Member States, from the duty of paying inheritance and donation taxes, treasury taxes and court and notary fees is absolutely unjustified and constitutes an infringement of both the EC Treaty prohibition of granting state aid to enterprises and the prohibition of discriminatory or preferential taxation. The so-called Property Committee (Komisja Majątkowa) acting pursuant to the Law, is composed in equal proportions of representatives of the State and the Polish Roman Catholic Church. Its task is to take decisions on the so-called compensations for the nationalisation of Roman Catholic Church property after World War II. It is an odd situation in which the Polish Roman Catholic Church (co-)decides on the granting and the scope of compensations for the property lost by the same Polish Roman Catholic Church, i.e. the latter is a judge in its own case. Needless to say, the Property Committee, having such a composition, normally satisfies demands for compensations or restoration of property ownership. Unfortunately, individuals from other EU Member States, who also lost their (or their legal predecessor’s) property after the last war, are not in an equally fortunate situation. Those individuals, being in an analogous situation, must refer the case to the court, where proceedings are time-consuming and onerous. They have no possibility of co-deciding in their own case, as it is in the case of Polish ecclesiastical legal persons. In our view this imbalance between the rights of Polish ecclesiastical legal persons and individuals from other EU Member States constitutes an unjustified violation of the principle of freedom of economic activity, according to which individuals from other EU Member States pursuing their economic activity in Poland (which involves court proceedings) should be treated not less favourably than Polish entities (e.g. Polish ecclesiastical legal persons). This substantiates the eighth plea of the petitum. The right granted to the Polish ecclesiastical legal persons in accordance with Article 55.3 of the Law is often abused, moreover, the transfer of funds for the aims referred to in the said provision is often beyond any control from the public authorities. It leads to essential and incompatible with the Community principle of undisturbed competition competitive advantage of the said entities vis-à-vis other individuals, including those from other EU Member States. In the opinion of the complainants, it substantiates the legal qualification of the ninth plea of the petitum. The duty to register one’s economic activity in court (or to enter it in the register of entrepreneurs) applicable to commercial companies constitutes a restriction of the freedom of economic activity justified by objective reasons. However, it is unacceptable that, according to Article 13.1. of the Law, Polish ecclesiastical organisational units are exempted from the said registration duty when the same exemption does not apply to other entities undertaking economic activity, including those from other EU Member States. For example, in Poland the registration of a limited liability company costs around 4,000 PLN (notary fee, court fee for registration and a fee for the publication of the information on the company’s registration). Such costs are not borne by Polish ecclesiastical organisational units, even when they — just like limited liability companies established by individuals from other EU Member States — pursue economic activity. This explanation substantiates the tenth plea of the petitum. The eleventh plea is based on the complainants’ familiarity with the not unusual practice. From what they know it follows that Polish ecclesiastical legal persons sometimes obtain preferential treatment from state-controlled companies operating on the market of production and distribution of electric energy and heat, whereas such preferential treatment is not accorded to other entities, including those from other EU Member States. This substantiates, in the opinion of the complainants, the eleventh plea. We request that the Commission informs us on the progress of the proceedings at all stages. Since our intention is to inform the Polish public opinion about the mode the Commission deals with the complaint, we request that the correspondence is conducted in the Polish language. We wish to emphasise that all correspondence from the Commission will be published in the weekly Fakty i Mity (Facts and Myths). Facts and Myths (Fakty i Mity) is a Polish weekly newspaper founded in 2000 by the former Catholic priest, Roman Kotliński. It reports on political developments which threaten Poland's constitutional separation of church and state and also has articles critical of Church influence on the social, economic and political life in Poland and abroad. The complainants above are 1) its editor-in-chief, 2) assistant editor and 3) editorial secretary.